French Theme Park Asks: Crows Can Pick Up Trash, Why Can't You? A team of six trained birds — rooks, actually — is collecting paper and cigarette stubs at the Puy du Fou park in western France. They drop the trash into a container in exchange for food. A rook at Puy du Fou theme park in France uses a special box designed to receive trash and reward the bird with food. "The park is very clean," Puy du Fou President Nicolas de Villiers tells NPR by phone. "The purpose of the crows ... is to educate the people, to open their minds, to think, 'OK, the birds are able to do something that we are much more able to do than them, so we should do this by ourselves.' "
Cigarette butts, in particular, seem to be dropped with abandon by people who could easily take them to a trash can, de Villiers says. Why not just pick them up? Even a bird can do it, after all. 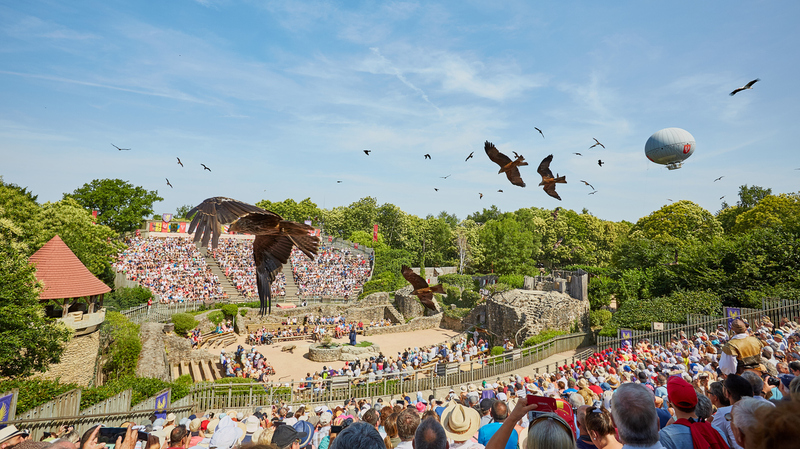 A falconry show is one of Puy du Fou's historical shows, featuring hundreds of falcons, vultures, kites and owls. Puy du Fou, which calls itself France's second-largest theme park, is located in a rural area and is famous for its historical shows — a Viking attack, Roman chariot races, sword fights and a falconry show. The idea for using rooks as litter collectors came from one of the falconers, Christophe Gaborit. As part of the falconry show, the theme park had already trained crows to pick up roses and bring them to a "princess" in a castle. Gaborit started training some rooks to do a similar task — with bits of paper or cigarette butts instead of a rose, dropping them off in a little box instead of delivering them to royalty. "It became a game for them," de Villiers says. "They pick up the papers on the floor, and they are rewarded." 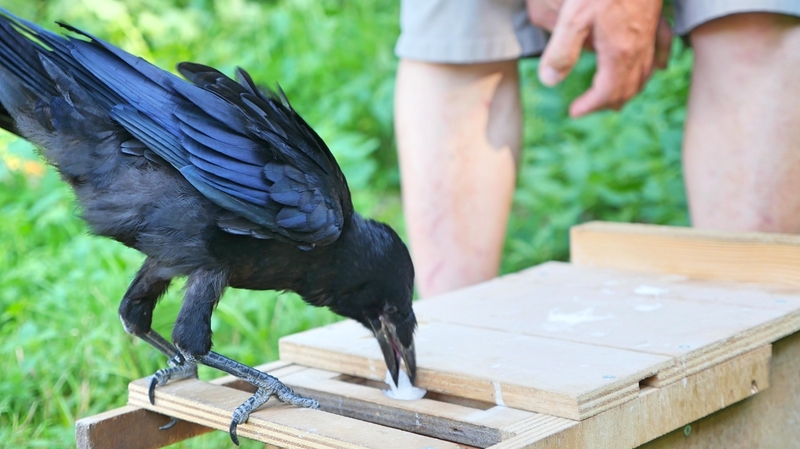 Birds in the crow family are famously intelligent — in the wild, they use tools. Ravens have been observed making plans. Crows remember faces and, when fed by a human, have been known to give gifts in return. And a decade ago, Josh Klein taught captive crows to collect money and drop it in a "vending machine" in exchange for a food reward, proposing a hypothetical system for training wild birds to do it. The Puy du Fou trash collection system is similar to Klein's "vending machine," rewarding birds with food for picking up certain items off the ground. It uses two different sections of a wooden box, one to receive trash and the other to offer up food. De Villiers notes that the park has a license for owning and training falcons and other birds and that ordinary people should not attempt to train a wild crow to do their bidding. After six months of training, the birds were first deployed at the theme park over the weekend. Their official introduction was Monday. They're each working four-day weeks under close supervision — a falconer watches to make sure people aren't dropping trash just to make more work for the birds. "It's an educational program," de Villiers says. "We don't educate the crows, but we educate the human beings. ... It's a funny way to show the people that you cannot throw the papers everywhere."